A desert conservation program on the outskirts of Dubai has managed two very different business goals, side-by-side. It’s achieved great success breeding local endangered species, while simultaneously developing a marketable tourism product. Fifteen years ago there were no known Arabian oryx left in the wild in the UAE. Hunting and over development had seen populations wiped out. 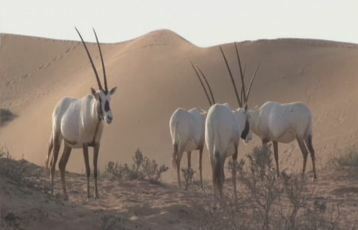 Today however, thanks to a successful breeding programme, and the preservation of their habitat, there are 350 oryx in the Dubai Desert Conservation Reserve. It was established in 1999 as Dubai’s first conservation area and right from the start it involved building an eco-style hotel within a 27 sq. km reserve. As well as protecting a piece of desert from development the area would house the breeding programme for the Arabian oryx. The Centre’s conservation manager, Greg Simkins, says it plays a major role in local conservation efforts. “I think if we didn’t create that protected area – the Dubai Conservation Reserve – at the time we did I think we wouldn’t have much natural areas left within Dubai. The rapid development that’s happened, the city’s grown exponentially really over time since then so we’ve been able to create this representative of the Dubai desert,” he says. Captive oryx were brought over from the United States. At the time it was a revolutionary idea and the first of its kind in the UAE. “So after the initial area had been set up we also looked at the surrounding desert areas and we saw there was massive impacts happening onto the natural environment there through things like vehicles out in the desert, rubbish and then over grazing as well. We then looked at creating this large protected area,” says Simkin. Three years later, 200 sq. km of land was added to the reserve which now makes up five per cent of the emirate of Dubai. More than 35,000 indigenous trees have been planted, and apart from protecting several endangered species the reserve is a major contributor to local scientific research and conservation efforts. To ensure the programme’s commercial viability, the Al Maha Desert Resort and Spa was established, to appeal to high-end travellers from both the UAE and around the world, according to their general manager, Arne Silvis. G uest activities focus on educating visitors about desert ecology and the UAE’s bedouin traditions and culture and 100% of all visitor revenue is spent on conservation and wildlife care. It’s the largest national park in the UAE and is officially protected under the constitution, to ensure it continues to operate as a National Park well into the future.